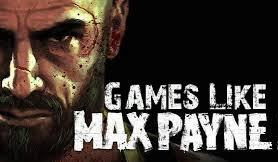 Games Like Max Payne '+g+"
This List of games like Max Payne offers a range of third-person shooters with gameplay similar to Max Payne. Max Payne is a third-person shooter video game series developed by Remedy Entertainment and Rockstar Studios. The franchise is notable for its use of "bullet time" in action sequences which slows down everything around the player while he can still aim and fire weapons in real time. This gives the characters an edge over the enemies. If you are a fan of third-person shooter games like Max Payne and looking for more games with similar game play then find the recommendations for it below and don't forget to mention if we miss any games as we keep on updating this list. Alan Wake's American Nightmare is a third-person shooter psychological horror video game, developed by Remedy Entertainment and published by Microsoft Studios. The game is a downloadable follow-up to its predecessor, Alan Wake, but is not a sequel. The game is an Xbox Live Arcade title and was released 22 February 2012. A PC version was released on 22 May 2012. Stranglehold is a third-person shooter developed by Midway Games' Chicago studio, released in late 2007 for Microsoft Windows, PlayStation 3 and Xbox 360. It is Midway's first game to use Unreal Engine 3, and was developed in collaboration with John Woo. Total Overdose (or Total Overdose: A Gunslinger's Tale in Mexico as it is known in the US) is an open world action/adventure third-person shooter video game that was developed by Deadline Games and published by Sci Entertainment in Europe and by Eidos in North America. Dead to Rights: Retribution is a 2010 third-person action game. It is the reboot of the Dead to Rights franchise. Featuring, Grant City police officer Jack Slate and his canine companion Shadow. Developed by Volatile Games and published by Namco Bandai Games for the Xbox 360 and PlayStation 3, the game was released on April 2010. This marks the series' first outing onto consoles in almost four years. Wet is a 2009 third-person shooter action video game, developed by Artificial Mind and Movement and published by Bethesda Softworks for the PlayStation 3 and Xbox 360 video game consoles. The game puts heavy emphasis on killing a large number of opponents while engaging in stylish acrobatic moves. Metal Gear series,.....if you can think of more, then don't forget to mention it in comments.